What a standard fence dimensions? Depending on a fence type, design and materials used for building fence actual measurements can vary from less than one foot to 8’ – 10’ in height and from ½” (12.7 mm) or even thinner to 10 – 15 inches or even thicker in thickness. While accurate specification of fence might be useful for building purposes height is the most important factor affecting the design and fence practical performance. Most prefabricated fence panels or boards made of wood, vinyl, aluminum or composite materials come from manufacturers in four different heights: 36” (0.91 meter), 48” (1.2 m.), 72” (1.8 m) and 96” (2.4 m). Other fence sizes including 42”, 60” or 84” available on the market as well, but they are not typical and rather rare than standard heights. Custom on-site build fence can be made any height as long as dimensions won’t be restricted by local building codes. Most vinyl or wood fence panels are made 8’ long and the actual distance between fence posts cannot be greater than 96”. Some panels are 72” long in such case maximum space cannot exceed 6’. For chain link fence line posts normally set every 6’ to 10’ apart depending on the distance between terminal posts. While building a custom made or decorative fence actual sizes of fence materials will determine how far apart to place the posts, but typically most post for residential fences set every 6 – 8 feet. On the slope additional fence line posts might be necessary to install. How deep fence posts should be in the ground? Depth of a hole for setting the fence post into the ground will vary and depend on type of a soil, slope and fence type. But normally posts have to be set at 1/3 of their length in the ground. While digging the hole always account additional few inches for gravel at the bottom. 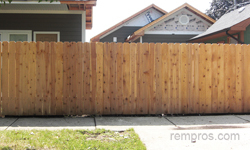 Pressure treated pine or cedar post for fences normally have 4” x 4” or 6” x 6” nominal dimensions and sold 6’ or 8’ long. Vinyl posts normally 4” x 4”, 5” x 5” and 6” x 6” and length vary from 72” to 102”. Line posts for chain link fences made of 16 gauge galvanized metal typically 1 5/8” or 2” in diameter. Round terminal posts are 2 ½” or 3” in diameter and 8’ long. Every city has its own regulation about building free standing structures on privately owned properties. Privacy fences normally restricted to maximum allowed height which typically 6’ (1.8 m). But there are might be some exceptions. If the purpose of a fence is to protect the property from animals, serve as a security barrier or help to absorb the noise from a street traffic city can issue a permit for building other than standard size fence unless it will contradict with other city laws. Practical use and homeowner’s preferences are the main factors which define the size of a gate. Walk through gates normally 36” in width minimum, but they can be built twice wider. Driveway gates might vary from 7’ in width single swing design to 18’wide double gates.